Premature aging is spreading across the UK and is particularly prevalent amongst recent graduates in the UK who, upon leaving university, are plunged straight into fears about the property ladder, pensions and paying off their student debts. These young people graduate at the age of 21, do not pass go and head straight to 35, worrying about their personal finance investments before finding their feet in life. These un-twentysomethings lifestyles can generally categorised within two extremes, either not going out at all because they have no money or going out and partying every Friday and Saturday night, because they feel directionless. Groups such as these may not seem particularly worrying, but many graduates are finding that they are working themselves to the bone by taking on two jobs and working seven days a week just to meet their bills. Some young graduates are known to even take on multiple jobs so they can bolster up their salary details for mortgage applications. By doing so, they commit themselves to a loan that can only be repaid through exhaustion. These characteristics have been assigned to the emergence of the quarter-life crisis, but this epidemic of financial concern tends to be a problem for those who have been through higher education, rather than those who took full time employment straight after leaving school. This represents a worrying trend given the government encouragement for increased school leavers to attend university. UK graduates find it particularly tough as they are often groomed to believe that they can get good salaries and corporate jobs. Yet many young people leave university only to be hit by the hard reality that the competition is immense and that expectations must be lowered. Some graduates, unable to find work immediately after graduation, get themselves into further debt by taking out career development loans and other forms of commercial borrowing to undertake a further qualification. Due to the volume of UK graduates on the market, the need to stand out has made life much more competitive. Contacts, professional qualifications, Masters degrees and relevant work experience are now required to help secure a “graduate” career. Moneynet ( http://www.moneynet.co.uk ), a consumer finance website, released a recent report stating that graduates need to check their credit histories when they finish their courses. Richard Brown, the CEO of moneynet warned that graduates could face a credit history nightmare at the end of university due to relocation, late payments and low credit. Moneynet has taken steps to provide publications which can help students and their families finance higher education, but the sheer scale of the student market now dictates that financial problems go beyond a lack of financial planning. According to Credit Action ( http://www.creditaction.org.uk/debtstats.htm ), a third of prospective students underestimate the cost of university, with 25% of freshers expecting their parents to foot the bill. Both parents and students apparently underestimate the true costs of university – parents by almost £4,000 and students by over £6,000. A quarter of parents state that they still have adult children living at home and over 14% of parents with adult children have remortgaged their homes or taken out loans to help their children out of the financial quagmire. Student debts and difficulties getting onto the first rung of the housing ladder are given as the main reasons for offspring being unable to leave home. First-time buyers are being required to save harder and for longer to secure their first home, in spite of a supposedly cooling housing market. It also seems that parents who try to help out their offspring by giving cash to get them out of their financial struggles may be doing more harm than good according to the NatWest. The report shows that those who accepted payouts from their parents were 25% more likely to then go overdrawn in the future than those who didn’t take this form of financial help. Overall a third of young people said their parents had never taught them how to manage their money. If you’re a parent and concerned that your children need help with managing their pocket-money, moneynet offers a family finance guide with a few suggestions.It doesn't offer a magical solution to student debt, but it might provide some help in financial management. About the author: Rachel writes for the personal finance blog Cashzilla - a mighty personalfinanosaurus who lives in Scotland with his girlfriend Nessie – the Loch Ness Monster. Adminisphere - The rarified organizational layers above the rank and file that makes decisions that are often profoundly inappropriate or irrelevant. What Separates Your Services From the Rest of The Pack? Determine what makes you UNIQUE. It's easier than you think! 1. What is the ONE THING that you do that others in your profession are NOT doing? 2. What is it about your actual business that makes you different or unique in some way? 3. What results can you promise your clients that others do not? 4. When a prospect asks the question, "Why should I hire you, instead of so and so" how do you respond? If you're really stuck trying to define what makes you different, ask a couple of your best clients why they chose to work with you—and continue to work with you—instead of your competitors. Use this information to create a unique marketing message that appears in all of your marketing efforts. Remember, if you're not differentiating yourself from your competitors –you ARE invisible to your prospects! If you are married with mouths to feed and your spouse is keeping the kids at home because daycare is too expensive, well... chances are you made the right decision. Sometimes two working spouses are not worth it once you consider all the variables. However, if you need convincing (or just plain curious) Microsoft has a tool that will bring it home to you. 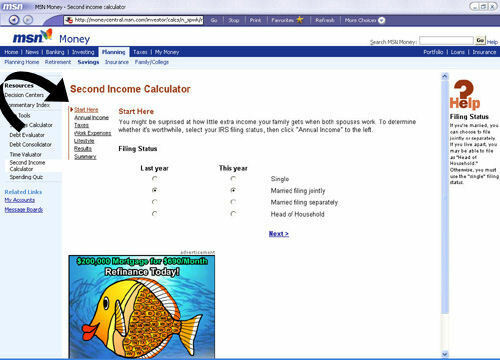 The Microsoft Second Income Calculator is a free tool for evaluating the true financial return of adding a second income. Its as easy as 1-2-3. 3. Review the results and be amazed. 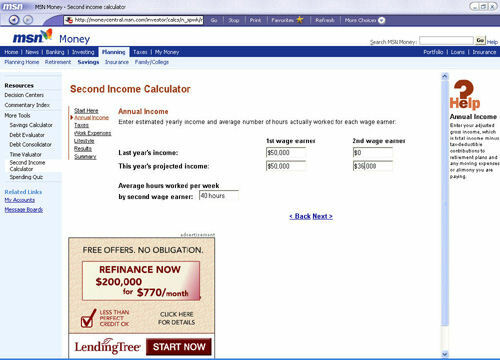 The Microsoft Second Income Calculator breaks down how much money you are losing (when applicable) annually or hourly as a result of taking on a second job. Workers who used to shuffle the cards and count the cash at casinos in Louisiana and the Mississippi Gulf Coast before Hurricane Katrina are turning by the thousands to a Web-based gaming industry recruiter to find work. H-R-Logix of Edmond, Oklahoma, markets recruiting management technology to some of the nation's largest casino companies. The company has teamed with more than 140 casinos to create an online listing where job applicants can view a collective pool of thousands of available gaming positions nationwide." The number of Americans thrown out of work by Hurricane Katrina shot up by 103,000 last week, bringing the total seeking jobless benefits because of the storm to 214,000, the government reported Thursday. The latest weekly jobless claims figure showed that the adverse economic impact from the country's most expensive natural disaster continues to rise as more evacuees are able to make it to state unemployment offices to file claims. The 214,000 total number of applications for unemployment benefits related to the hurricane included 91,000 claims for two weeks ago, a figure that had originally been put at 68,000, and 20,000 claims for the week ending Sept. 3. The 103,000 new hurricane-related jobless claims were out of a total of 432,000 claims last week, which was the highest level for total jobless claims since July 5, 2003. Last week's total increase was up from 424,000 claims filed the previous week. Some private economists are predicting that a half million people or more will have lost jobs when Katrina's final economic toll is calculated. Do telemarketers get on your nerves? If so, this is the cure that ails you. The National DO NOT CALL list. It will only take a minute of your time. It blocks your number for five (5) years. What do you do when recruiters call you at work? Oh, to be among the wanted. That's what many workers out there say when they hear friends or colleagues moaning that they don't know what to do when a recruiter -- or headhunter -- calls them at work to tell them about an exciting new job. But to be among the wanted: It can be a tricky balance of checking out an opportunity and remaining loyal to an employer. And it's particularly difficult when one is sitting at that employer's desk, talking to a recruiter on the telephone. So sneaky. So underhanded. So common and so necessary. The workers are well known or other people refer them, and they are very good at what they do. These people are in very senior positions or have specialized skills. Others are found because they are incredibly active in their job searches, whether they are searching or not. They are on job boards and databases, and because of that, they end up in recruiters' files or simply on a recruiter's radar screen. Often. And others are found because they are very public. They are association officers or on boards, or can be found easily via a Web search. These are people who hold positions in the community. Therefore, recruiters or organizations know about them. These people might get calls rather often from recruiters who are paid by companies to find good hires for open positions. The recruiters are essentially trying to make a sale. That's great for a lot of people. But the question lingers: How do these people handle the sticky situation of being recruited while at work? Gary put his resume on a billboard and it worked! Here is an interesting strategy I picked up from Sourcing - Recruiting Sources Secrets, it seems that someone has rented a billboard to hype their resume. 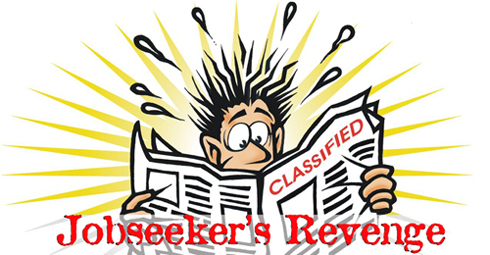 When a person is informed by his employer that he is being terminated, the first inclination is usually to begin scouring the classified ads. But Gary Radke of Bellevue has gone the route of blowing his name up and putting it on a billboard to aid in the hunt for his next career opportunity. Radke, 35, was recently let go from his position as director of event marketing and e-commerce at the Weidner Center for the Performing Arts because of the facility’s recent financial struggles. He was one of six people who was told his employment would be terminated at the end of June. Radke said that while he has checked online for job postings at company Web sites since learning of his fate several months ago, it was not until recently he decided to pursue using a billboard to publicize his quest for a new job. The State Government could be liable for more than $1 billion in extra compensation for thousands of asbestos victims it abandoned because they were smokers. A Daily Telegraph investigation has found that a recent landmark court decision could hit the Government's coffers at a time when it is already under massive financial pressure. For years the Government's Dust Diseases Board had rejected the claims of hundreds of victims of asbestos-related lung cancer because the workers were also smokers, even though most asbestos workers smoked. But in a case brought against the board, the District Court ruled asbestos exposure multiplied the cancer risk in a smoker and that the board had to pay compensation. Medical experts spoken to by The Daily Telegraph estimate there could be between 6000 and 12,000 sufferers of asbestos-related lung cancer diagnosed by 2020. With a typical payout of about $200,000, if just 6000 came forward it would cost the Government $1.2 billion. Train driver Isamu Tatsutani is not the only former employee of the West Japan Railway Co. to have died of mesothelioma, a type of lung cancer caused by asbestos. But his legacy is unique-a set of four diaries, detailing his two-year fight with the disease, culminating in his death in summer 2004. He was 61. Along with his love for his family, one theme runs throughout his diaries: "Why didn't the company tell us of the danger involved?" he asks, again and again. A native of Kakogawa, Hyogo Prefecture, Tatsutani was exposed to asbestos while working for what was then the Japanese National Railways (JNR). Thirty years later, mesothelioma claimed his life. Estimates suggest there could be as many as 100,000 former JNR employees who, like Tatsutani, were involved in the maintenance and scrapping of train engines and carriages, where they inhaled asbestos particles used as heat insulators. In 2004 there were 7,080 new cases assessed as qualifying for compensation under the Department for Work and Pensions' Industrial Injuries Scheme. This compares with 7,910 new cases in 2003. There were falls in cases of chronic bronchitis, vibration white finger and carpal tunnel syndrome. Cases of asbestos-related disease (mostly mesothelioma and asbestosis) continued to rise. Each year an estimated 6,000 people (uncertainty range 3,000 to 12,000) die from cancer due to past exposures at work. In 2003 over 1,870 people died from mesothelioma, a cancer caused mainly by occupational exposure to asbestos, and around, as many again are likely to have died from asbestos-related lung cancer. In addition to these cancer deaths, over 100 died from asbestosis and nearly 250 from other types of pneumoconiosis, mostly associated with coal dust and silica. Unless you live in a plastic bubble, secluded from the outside world, you are no doubt feeling pain at the pump. When I took this picture two weeks ago (above), unleaded was coasting at $2.81 in my neighborhood. Thanks to a concerted effort to squash price gouging (and mass hysteria over potential gas shortages), the cheapest unleaded now hovers at $2.62. And to that I say, "Wow!" Who would of thunk that a $2.62 would only buy one gallon of gas? Not I and I suspect, most unemployed jobseekers did not consider that either. As frustrating as it may be to interview and interview and interview for your dream job (or any job for that matter), now it may very well become too expensive to find work! I mean, do you buy groceries or fill up your tank for the week? Ouch! Well, if you can identify with this rant, help is here and Microsoft is bringing it. 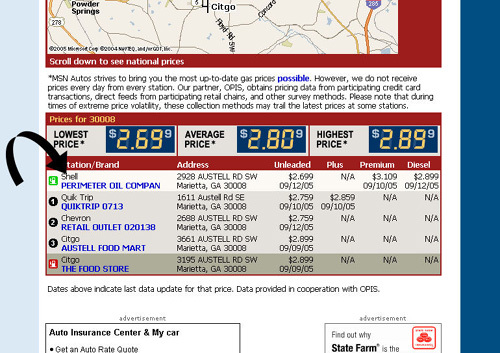 Follow-along as I show you how to find the lowest gas prices in your neighborhood. Its as easy as 1-2-3. 1. Hop over to http://autos.msn.com. In the left hand colum is a link called "My Car." In case you have thick Coca-Cola glasses and vision like Mr. Magoo, I have an arrow pointing to the "My Car" link in the above screenshot. 2. 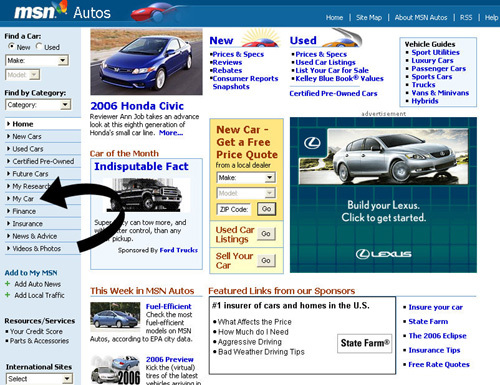 Under the "My Car" section is a link called "Gas Prices." 3. Up pops a map citing gas stations in your area that MSN has been tracking. All you have to do is add the zip code for your area. How do we do it? 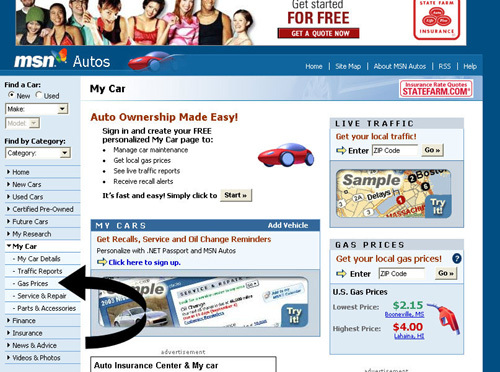 Every night MSN Autos receives pricing data from over 90,000 gas stations across the nation. We then process that information and provide it to you free-of-charge. Pretty cool, huh? 4. 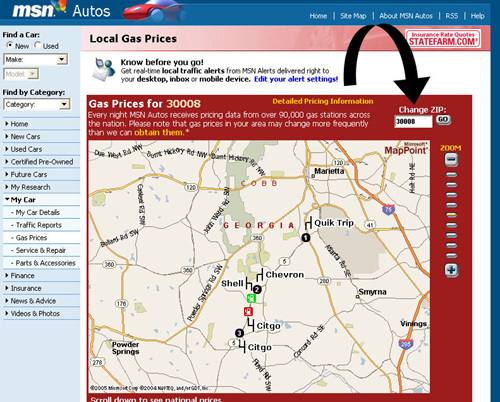 Scrolling down from the map, you will notice that MSN Auto sorts gas prices by zip code and ranges them from Cheap to "You-gotta-be-kidding!" (or whatever expletive you desire). Anyways, the cheapest gas is always on top. Hope this helps! 1. Not preparing for the tough interview questions. Like every job seeker, you probably have your own set of tough interview questions you hope will never be asked. The best strategy is to prepare ahead of time with answers to ALL of these questions. A career coach can be a great resource for helping you work out suitable answers with a positive spin onnegative or challenging career situations. 2. Failure to match communication styles. Making a great first impression is easier to do when you communicate effectively with your interviewer. The best way to do this is by mirroring his or her communication style. Allowing your interviewer to set the tone of the conversation will put him or her at ease and makes the conversation flowmore naturally. * If the interviewer seems all business, don't attempt to loosen him or her up with a joke or story. Be succinct and businesslike. * If the interviewer is personable, try discussing his or her interests. Often personal items on display in the office can be a clue. * If asked a direct question, answer directly. Then follow up by asking if more information is needed. * Taking too long to answer direct questions. The impression: This candidate just can't get to the point. * Nervous talkers. The impression: This candidate is covering up something or is outright lying. 4. Saying negative things about your current or past employers or managers. Even if your last boss was Attila the Hun, avoid stating your ill feelings about the person or work situation. No matter how reasonable your complaints, your negative comments will be viewed as disrespect towards your boss. When faced with the challenge of talking about former employers, make sure you are prepared with a positive spin on your experiences. 5. Giving away too much salary and earnings information. Candidates often weaken their future earning potential by speaking too freely about their current income. No matter the official salary range of the position you are interviewing for, your current earnings have an enormous effect on the size of the offer. Investing in a career coach to help you answer salaryquestions can add thousands of dollars to your new job offer. In the middle of a winter night last year, the family of a forklift operator in Danville, Ill., suffered two devastating blows. In a fire that destroyed their home, the Kemps also lost their youngest child. While the family had no pastor, priest, or rabbi to turn to, someone came to their aid immediately: the chaplain at McLane Co., David Kemp's employer. Cleveland Taylor arrived amid the fire trucks, helped the family get clothing and meet its needs over many weeks, and held the funeral service for the baby. As fewer Americans attend houses of worship on a regular basis, more people are receiving the compassionate help one might expect of a minister from corporate chaplains - professionals hired by companies to be a listening ear, a quick responder in crises, an arm to lean on through difficult challenges. It's not that businesses are trying to take on a religious role. Corporate chaplains serve people of any or no faith, and the use of their services is voluntary. But business leaders increasingly recognize that employees who face crises often can't help bringing their personal difficulties to work, and job performance can suffer. Making provision to care for their workforce becomes a part of good business practice. Bringing chaplains into the company "takes issues away from managers that they don't know how to handle and gives them to those that do," says Tim Embry, CEO of American LubeFast Inc., based in Duluth, Ga.
As a result, many employees are getting support that can make a significant difference in their lives, while companies say they're seeing a more satisfied, even more productive workforce. READ: Spiritual guidance... in the workplace? Ron Parker is from New Orleans. He was living in Los Angeles before moving to Atlanta a few years ago. He had about 30 relatives that have disappeared. Luckily his mother and her mother was visiting Los Angeles at the time but they live in New Orleans. His wife and his three daughters and their family is okay and was not in New Orleans. His father passed away years ago but his father's sister and his mother's brother's family - about 30 people total have disappeared. The bad thing is that the family homes were right next to where the levee broke where all the houses were 10 feet under the water. He is really getting more upset by the day and said he might go down there soon. He has 8 other people staying with him who were friends of his daughters in college. He told me not to send a BIG email or tell anyone about what was happening and that they were going to try to solicit help from www.blackamericaweb.com/relief But it might help if we took stuff over or gave them money. I told him they have sent people to 30 states so it might take at least 6 months before he hear from them. That's got to be hard. You can help me look for them. I have been posting their names everywhere...You can also help to post their names. A job fair has been organized and is seeking companies and organizations that have job openings at any and all skill levels. If you are interested in participating on one or both days, please contact Miranda Roberts at mroberts@cityofstockbridge.com or 770.389.5982 ext. 221. If you have only one or two openings and can not attend the job fair, please email (WORD format) the job description and contact information and copies will be distributed to attendees/ hurricane evacuees. Ryan Clayburn isn't too picky about where he'd like to work next. He just wants to get back to work after Hurricane Katrina last week ended his position as an outside salesman for a company in New Orleans. "Right now I'm looking for anything in sales, but I'll take anything at this point," said Clayburn, dressed in a snappy new suit he bought Tuesday for any job interview that might come his way. Clayburn was among an estimated 1,000 people, most Katrina refugees with a few locals thrown in, who took advantage of a job fair Wednesday in downtown Atlanta put on by the state of Georgia. Back in New Orleans, Clayburn's wife, Jennifer, had been the director of sales at a Wyndham Hotel. She fortunately has already landed a new job in Atlanta, a position in the sales office of the downtown Sheraton Hotel -- the same hotel where the job fair was held. "We live in Hammond (north of New Orleans), but we are moving to Atlanta," said Clayburn, who sold liquid gas products for Messer, an industrial sales company in New Orleans. "We are getting out of there for safety reasons," he said. "There were three shootings in my neighborhood last night and a shooting at a local gas station." At the job fair, more than a dozen companies had booths set up to meet one-on-one with applicants. The usual requirement that all applicants present a Social Security card or other papers was waived for the day, considering most of the refugees didn't grab their important documents as they fled their homes. More than a week after Hurricane Katrina left her city in sodden ruins, Beth Bridges isn't dwelling on what she lost. Like thousands of other New Orleans refugees in Houston and elsewhere, she's hunting for a job, a home and a new start. "I hope to find something in higher education, but secondary education would be okay," the 54-year-old former Dillard University administrator said as she wandered past tables and job postings at a hastily-organized job fair in downtown Houston Wednesday. Job postings from employers at the fair ran the gamut of skills, from bank tellers and licensed plumbers to data entry clerks and warehousing laborers. Oilfield services company Baker Hughes sought engineers while Christian Brothers Automotive advertised for technicians and shop foremen. The U.S. Army posted a contact number, as did the Houston Public Library, the Houston Zoo and a temp agency. The Houston school district also is seeking teachers, counselors and other professionals. Similar scenes played out in other cities that have taken in Katrina refugees seeking work. The nation will observe Labor Day this coming Monday, allowing millions to enjoy the waning days of summer, as well their last chance to wear white pants without earning a "tsk tsk" from Miss Manners. How did this early September holiday get its start? Though President Grover Cleveland declared Labor Day a national holiday in 1894, the occasion was first observed on Sept. 5, 1882, in New York City. A parade was organized by the city's Central Labor Union, a branch of the Noble Order of the Knights of Labor, a secretive labor union founded in 1869 by a clique of Philadelphia tailors. Historians still debate over whom, specifically, to credit with the idea of a holiday dedicated to the workingman. Some say that Labor Day was the brainchild of Peter J. McGuire, co-founder of the American Federation of Labor. Others argue that Matthew Maguire, the CLU's secretary, was the holiday's mastermind and that he doesn't receive proper credit because he ticked off the mainstream labor movement by running for vice president on the National Socialist Labor Party ticket in 1896. Read: Why do we get Labor Day off? Construction company hiring 1000 people to help with hurricane clean up. $10/hr, 80-90 hrs weekly, food, lodging, transportation to area. Start immediately, could go on for 1-2 yrs. Anyone interested can call directly to LVI Svcs, 713-991-0480. In part two of my conversation with David Teten, I discuss his venture "Circle OF Experts" and its benefits to jobseekers. Are you interested in consulting to leading hedge funds and other institutional investors?